Dame Enid Diana Elizabeth Rigg, DBE (born 20 July 1938), is a classically-trained English actress who has worked with Britain's Royal Shakespeare Company and National Theatre, as well as appearing on Broadway. She has received the Tony Award for Medea, as well as an Emmy Award for playing Mrs. Danvers in a TV adaptation of Rebecca. She's also played Hedda Gabler and Regan in King Lear, among many other parts. She was made CBE in 1988 and a Dame in 1994. Oh yes, and she's also known for her groundbreaking and iconic role as Emma Peel, the most famous female partner of British agent John Steed (Patrick Macnee) in the British TV series The Avengers, and for playing the only woman James Bond has ever married in On Her Majesty's Secret Service. 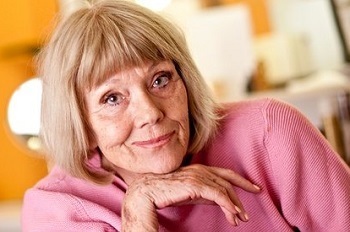 More recently, she played Lady Olenna Tyrell in Game of Thrones. She has a daughter born in 1977, Rachael Stirling, who's also an actress, with a prolific career on both stage and TV. The two of them appeared in Doctor Who, in an episode that was apparently written specifically for them. In other words, Diana's gone from helping to invent the Spy Catsuit trope by wearing it, to playing a seriously scary sort of Cool Old Lady. When Lady Olenna Tyrell boasts about her sexual charms when she was young, it's a fair bet that many viewers are remembering Emma Peel in leather. And one advantage of her acting skill is that she's been able to play a formidable Deadpan Snarker at any and every age.